hi nancy! in a *stunning* coincidence, i just started reading a book last night about, well, cannibalism. the author makes the point that consuming what's necessary to survive is an evolutionary practice going back to the beginning of time. So little fir tree is on the right track. As for composting...good for you and everyone else who practices this. My dad was a composter in the 70s back when no one had heard of it. i like to think that he did so much of it that he got me a free pass.....i don't like the ewww factor. but i imagine juliet (and the rest of the crew around here) is bound to shame me into it before long! One of my most recent interesting discoveries was that our garden regenerated itself this fall. Due to other things going on in our life since the summer, we took a hiatus from the garden for 6 months, but it turns out the root vegetables have been thriving without us! Yes, my long-term evil plan is to convert Sophie into a composter. I imagine once she takes it up, she'll be showing us all how to do it! Seriously, I love this -- love the fir tree, love the composting! I've got a survival of the fittest attitude towards my garden, too, but it's amazing to see how the plants respond to a little leftover lovin'. I have a friend who, when she learned the concept of composting, would stand in her backyard and chuck the apple cores and coffee grounds at the base of her tomato plants. She was so upset when they all died! Great post. Thanks so much, Pens, for having me here. I'm honored to be in your company. Special thanks to my CP buddy Gigi for inviting me. Thanks, Juliet and Rachel, for your warm welcome. I'm glad to know there are other composters out there! 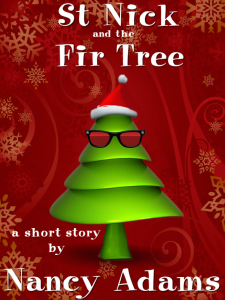 Fir Tree sends its greetings to all the Pens! I love earthworms! Faithful tillers of the soil. There's the cutest children's book called "Diary of a Worm," all about a little earthworm and his spider buddy. I got it for my nephew and then got a copy for myself. It's one of my favorite picture books. Fun post, Nancy. I'm a big composter. I even recently bought a nice little metal can with a foot pedal for my workplace, and I take the vegetable leavings home once a week. I put in all the vegetable garden and kitchen stuff, plus leaves, and turn the pile once or twice in the summer. When my son is around, he even screens it for me. It's lovely to think of food returning to food.